With employee turnover, added complexities of M&As, and other natural complications, your organization could fall out of place with the global marketplace. But when industry fluctuations occur, your company needs robust processes and established protocols in place to help you stay on top of your IT operations. It’s time to consolidate IT vendors. In this e-book, we break down how so many organizations find themselves with too much to manage and too little information available with which to manage. Learn how to regain the control over your IT operations. 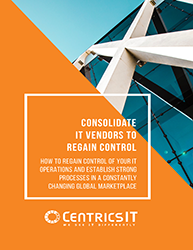 Download the e-book today to unveil how to regain and firmly maintain IT operations control, according to industry best practices. Learn more about how streamlining your vendors and unifying your support experience gives your organization added control of costs and mitigation of wasted resources. Download the e-book now.